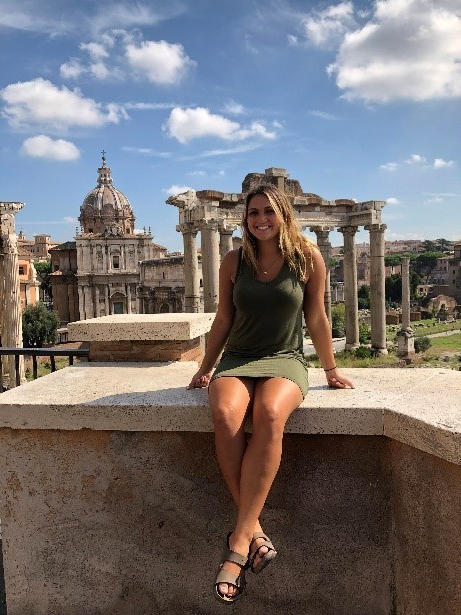 My name is Maria Ruettiger and I am a sophomore, studying abroad in Florence Italy or as the Italians would say, Firenze. 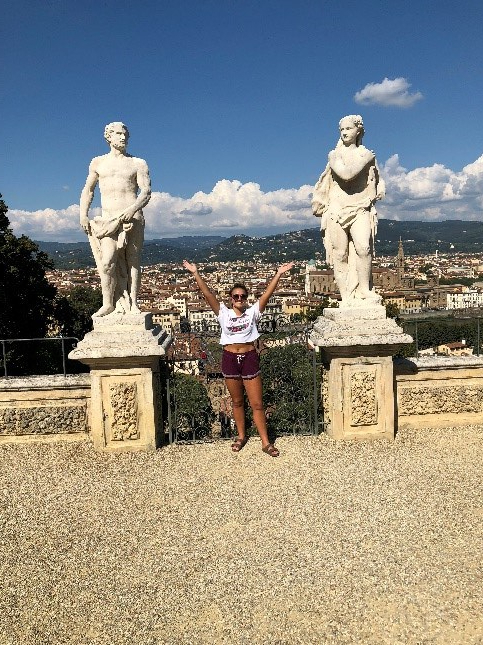 My major is elementary education and I chose to study abroad in Florence because I have always wanted to go to Italy and immerse myself into a different culture. Florence is a smaller city compared to a city like Rome. 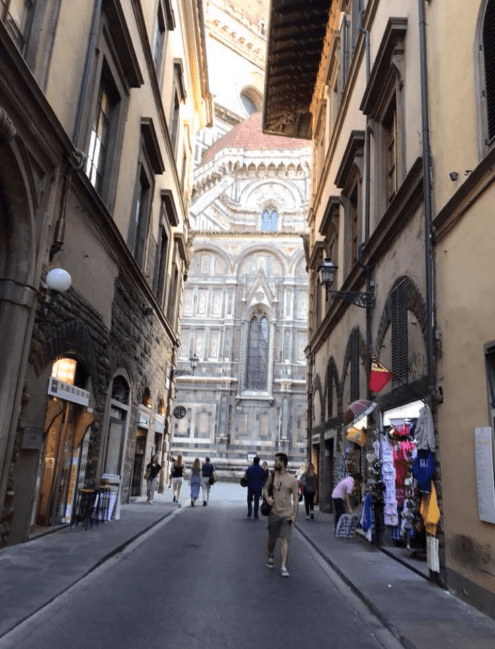 In Florence you are able to walk everywhere and the streets are narrower than one would be used to in the United States. I can tell it is very family orientated where I live because I constantly am seeing families together and I have met many shop owners that their businesses, in fact, are run by the families themselves. I have almost been in Italy for 3 weeks now and I have not traveled much outside of Florence because I wanted to explore the city I am living in and wanted to get comfortable here. Although, I did travel to Rome and it was a breathtaking city, but much more spread out then Florence. 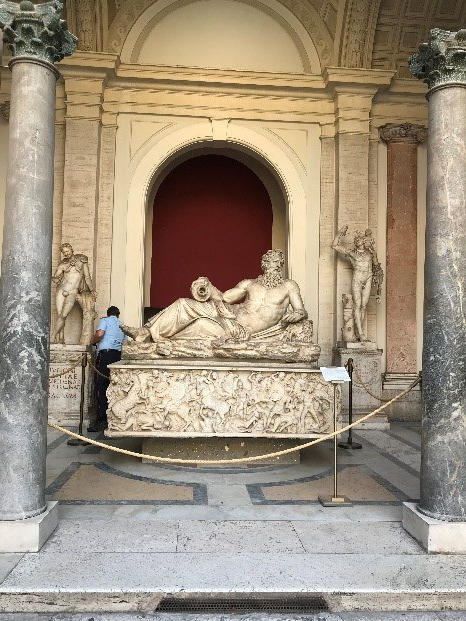 In Rome I was able to take a tour in the Vatican, go into a Church called Santa Maria Maggiore, see the Colossum, and go to the Trevi Fountain. Today went to visit the Navy base in Cobh. When we arrived we were greeted by commander Roberts. He took us upstairs to their conference room for some tea and coffee. We talked about numerous things such as gun control and politics. This trip has really opened my eyes about how much people actually keep up with what is going on in America. He then sets us up with one of his officers for a tour of “Fox Island”, which is the Naval Base for Ireland. We got to see one of their battle ships which was awesome! We got to see where all their ammunition is stored, as well as, simulators of their equipment. We then went to the dining room where they served us a complimentary delicious steak and salad lunch. We then wandered around Cobh for a while until it was time to go back to Cork for dinner. Today went to Galway. On the way we stopped in a town called Sligo. I have started noticing more Gaelic writing as we have driving, since we are no longer in Northern Ireland. In Sligo we got to visit and tour the Sligo Abbey. The church has a sad story. It has been through many fires and a horrible plague, which caused Ireland to lose an extreme number of people in not just deaths, but people who fled Ireland. The church was also used during the Viking era. We then reached Galway, which is a town full of rich history. It is a young, traditional, and busy city. Today we got to meet some other travelers and talk with them, but then we mostly rested after having had such a busy day. This morning we had breakfast in the hotel around 8:30AM. We then got ready for a tour at the Queens University. It is an extremely old university (1848). There was an extreme number of inventors that thrived from the Queens University. We then walked to the city hall at noon to further out knowledge of Belfast’s past political conflicts. We then went to a bar known as the “Perch”. It was a rooftop open area with a bar. It had a lot of colorful flowers. After a few hours of conversing we got ready to meet with our air coach at the hotel. As well as our tour guide of the “peace wall”. We drove beyond the downtown Belfast area. To the “suburbs”, and unfortunately there were no good stories. Ireland has terrible relations with the Republics and Unionists. There were terrible shootings and tragedies at almost every corner. We got to see the differences of both sides because only one street separate’s them. They literally put a “Peace Wall” dividing the two reducing the amount of crime. Whenever there are problems the police close the gates. People were commonly wrongfully detained in prison (Belfast Prison). This was an extremely interesting day. When else would I get the chance to go to Greece for less than $1000? Thursday and Friday, Italy celebrated their version of Independence Day, so we got a four day weekend. We decided to take a couple flights and get ourselves to one of the most talked about cities in our history books. Home the goddess, Athena, herself. We got a 3 day tourist pass which got us access to the metros and train for our weekend. On the first night, we took the metro, towards the Acropolis for dinner. Restaurants line the sidewalks and waitresses and waiters line the street offering specials and deals for your meal. After choosing one, we were finally able to chill out after a long day of traveling. From where we were, we could see the lit up Acropolis from the street. We decided to walk towards it. As we started, we noticed the road up to the Acropolis being blocked by police. Supposedly, the French Prime Minister was in town visiting and just got done with his tour. Once we got access to the street, though, we were able to get a really close view of what we planned on seeing the next day. We scheduled a Skip-the-Line tour at 11:15 the next morning. We planned this one better than our Rome trip. Being a student in Europe, we were able to get our entry tickets for free! Our tour guide had so much knowledge about the ancient ruins we saw. We thought coming into this trip that we had no knowledge of the the Greek language, except for sorority life. We soon learned that words like “polis” is for city in an administrative meaning and “acro” means to be up the in the air. So our words like police, politician, Indianapolis, and acrobat all were derived from their language. The Acropolis was a word that we could identify with. The Acropolis isn’t special to Athens. There’s more than 200 across Greece. They were used to protect their Gods and in cases of invasion. There were many hills in Athens but this hill got chosen for its access to water. Going up to the Acropolis, one can also find Theater of Dionysos. This is the oldest theatre in Europe. Theaters in Greek times were a religious place where priests would make a sacrifice, usually a goat, in the middle. They would dance and sing and this is where orchestra came from. As with any business, you want to put your business where the people are located. Therefore, also on the way up was the ruins of a shopping mall. In dedicating the city, the people had a decision to make. Both Poseidon and Athena wanted it. Naturally, the people asked for a gift and whoever’s was better won. Poseidon gave a spring, which would be great, if it had not been salt water. Athena gave an olive tree. Useful for wood products, furniture and food. Therefore it is her Castle at the top and her name for the city. On top of the Acropolis there are at least 4 castles. All have been reinforced with their original material and some new in order to keep up with the wear and tear. One, Temple of Nike, was dedicated to the god who ran barefoot for many miles to bring the good news of a battle won in Marathon. Nike was known for being the winged angel that brought victory to all. Athens, selfish, cut off his wings so he would not leave the city and bring victory to other people. Another one of the castles was created for Poseidon and Athena as sort of a truce to stop the fighting between them. The Parthanon was, of course, dedicated to Athena. It took a lot of destruction when the Turks tried to invade. Inside stood her statue covered in 24 carrot gold when they were not being invaded. Contrary to popular belief, the Olympic flame was not introduced by the Greeks. It was introduced by Hitler in the 1936 games. The Olympics began as a religious ceremony for Zeus. They were every 4 years where there was 1 day of religion, 3 days of sport, and 2 days of festivities. From the top of the hill, we could see what remains of Zeus’s Temple. I’m so glad we did the tour, as we wouldn’t have really known what to think of any of the rocks. A lot of people on their way up to the Parthanon lost that information by not getting a tour, so I definitely suggest it! We woke up and went to breakfast at 8:30 am on the dot because they really prefer everyone to be on time since it runs like a community. After breakfast we started our many activities for the day. We went outside in the front and saw a puzzle drawn by chalk on the ground. We had to work together by one-at-a-time trying to navigate the correct path through the puzzle. It was fun and a good communication builder. After reflecting on the use and importance of teamwork, we went to the backyard. For this activity we had to figure out how to guide a ball through a zig-zagged puzzle which we each held a part of. There was then a tea break, but we decided to play with the rugby ball for a little instead. Our next activity was a great learning lesson. In the chapel we each played a trading game with one another that ultimately ended up segregating us into social classes by our own choices. It showed us how power can consume us, because the “first-class people” made selfish decisions. My favorite part after this was visiting the Irish Sea. It was breathtaking and we got to explore all around the beach and rocks. After dinner we reflected on our time here by creating a web of yarn based on each of our experiences here. We then had a bonfire which was a lot of fun. We ended the night playing pool and foosball in the playroom, and having my favorite…toast and cocoa. I loved Coorymeela and ended up appreciating it more than I expected to. After breakfast and many laughs the following morning, we headed to the Titanic museum. It was cool getting to learn about the ship being built in the exact area we were exploring. The museum was even in an abstract shape of the ship, which felt like an awesome memorial for it. Our next stop was Storemont, which is one of the government buildings in Northern Ireland. After an educational tour learning about the politics and relations to the Queen we explored on our own for a little then headed to our next destination. As we were approaching Ballycastle (the town Coorymeela is in), we started to see more mountains and the Irish Sea. The scenery was beautiful and more country than city. When we all arrived none of us were sure what to expect because it seemed more like a retreat. We were greeted by Ellis and Annalena who was to be our guide during our stay. We arrived right at dinner time, and had a community dinner and helped clean up afterwards. We had a peaceful night and all hung out without Wi-Fi, which was different but I did not mind it. I was a little uncomfortable the first night but I was ready to give it a chance in the morning. 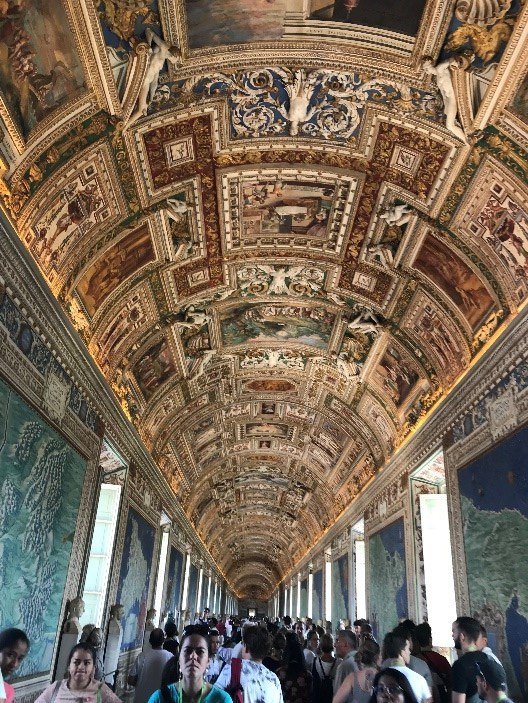 Hannah, attendee of the faculty-led Ireland and Northern Ireland Co-Cultural Experience program during the Summer of 2016, submitted the following blog posts as a documentation of her time abroad. These will be uploaded in a three-part series. We all woke up and ate a buffet breakfast at our hotel. After breakfast we went on a tour of Queen’s University. It was a beautiful campus with a lot of rich history. We learned how their cost of education is much more affordable and a priority to their people versus ours. There are only two universities in Northern Ireland, Queen’s University and Ulster University. After that we went on a guided tour of Belfast given by Richard Meeley, who was a past convict during the Troubles. He was such a nice guy and had a passion for what he believed in, and was also very informative. We saw the murals drawn by different people expressing the sides they stood for, Unionist or Revolutionist. The Catholics and Protestants have been at war for so long and the bombings and violence has been almost never-ending. We visited each side of town and saw the effects of years of violence. One crazy thing was seeing the huge wall that divided the two sides to help reduce violence. Many of the people are praying for peace, but most never actually see it happening. It was an eye-opening experience, and almost every local discusses the conflict. After the tour we took Richard to the Botanic Inn pub for a pint and to hear more of his stories. Later, we had another nice dinner at Robinson pub and then went out on the town for our first night. We got to meet many locals and it was a great day! I am George Anaman by my Christian name but you can call me Papachie because that is actually my Ghanaian name! I will be working as a Graduate Assistant at the Study Abroad Office for 2016/2017 academic year. I am a new international student enrolled in the Masters of Art program in Economics at Eastern Illinois University. I will be graduating August 2018 so I guess I have a long way to go but I know it will be worth it staying at EIU with it wonderful students, faculty and staffs. I was born in the Western region of Ghana, Sekondi –Takoradi, the only twin city in Ghana where most Ghanaians are envois with our Fanti (Local dialect). Western region can boast of producing most of Ghana’s natural resources which includes Gold, Bauxite, Manganese, timber, cash crop and oh I forgot, we are the region that produces oil for Ghana. We are the engine that drives of our economy. Aside natural resources, we have beautiful beaches spanning along the coast, tourist attraction areas like Nzulezu ( Village on Silts ), Monkey hill, Ankasa Forest, Fort San Sebastian, among others. Ghana , officially the Republic of Ghana, is a sovereign unitary presidential constitutional democracy, located along the Gulf of Guinea and Atlantic Ocean, in the sub region of West Africa. Ghana is bordered by the Ivory Coast in the west, Burkina Faso in the north, Togo in the east and the Gulf of Guinea and Atlantic Ocean in the south. My country has 10 administrative regions of which the capital is Accra. Ghana is popularly known for its hospitality. We are very helpful to foreigners in any way possible to make their stay a worth reminiscing one. My American friends in Ghana will also be like, Ghanaians are super friendly but hey, that is our nature. We just can’t help but be friendly and helpful. So I hope as you are reading, you will one day make it a point to visit my country to have a taste of her rich culture and I will forever to happy to help you with your plans when you come over to my office at Blair Hall 1207 during my office hours. Now back to myself! I had my primary education in Services Basic school which is a Ghana Armed Forces School and went through the educational ladder to have my tertiary education at the University of Competitive Choice I mean University of Cape Coast. The University of Cape Coast is one of the rare sea front universities in the world. I read Economics and Mathematics for my Undergraduate studies and completed my bachelor’s degree in 2015. As a child growing up, I was always passionate about travelling around the world and decided to be a pilot. Come to think of it, pilots get to fly around the world and they really get to see how beautiful nature is when in the skies, right? So as a smart kid, I was like why don’t I be a pilot and utilize that opportunity to travel around the world haha.. I know it sounds funny. But I held on to my dreams of traveling abroad through to my University education when the Centre for International Education Office at my University offered me the opportunity to go on an exchange program to Grand Valley State University, USA for a semester in 2014. It was just a dream come true for me because America had always been my number one top destination. To explain why, I see the country to be a converging point for people of all walks of live. If I am in America, the chances of meeting someone from Pakistan, India, Brazil, Sweden, Kenya, Japan, China etc is decently high. At least, if I am not able to go to all those countries listed, getting to meet them and interact with to know their country and their way of life is even a plus to me. Going on an exchange program to Grand Valley State really had a positive influence in my life, I must be sincere. I met a lot of great people during my Stay in the United States including Students (both Locals and Internationals), faculty, staff and local residents. I thought Ghanaians were nice, but I must pour it out, Americans are super nice, welcoming, giving, full of energy and fun to be with and that actually influenced my decision to return to the US for my Masters and I am loving the experiences so far. Mmh , come to think of some funny experiences I encountered during my stay. I clearly remember my first night in the US when I got to my apartment. I went upstairs to unpack my luggage and had a quick chat with my Swedish roommate. I ran downstairs and came across a thermostat and as curious as I was, I got close to it only to read 75 degrees. I was like “No way! This is close to boiling point” and lowered it to 31 degrees. My roommate after noticing a sharp change in the room temperature shouted my name and was like “GEORGE, what did you to the thermostat! !” I was just confused about what was going on around me haha. So ignorant of me, I was reading the temperature in Celsius not in Fahrenheit. I was confused a couple of times with some metric systems like Miles, Gallons, but with time I got used to it. Ah I forgot! My first snow!! It was so beautiful and so white!! On that very day, I remember it was early morning and excited as I was, I run up to my roommate in our apartment to come outside because it was snowing. He lazily starred at me from his bed and was like “George, for goodness sake, I am from Sweden! !” it was funny though. This was my last day of class in Quito, and it was very bittersweet. I’d had the same professor for 4 weeks and I had great classmates this week. Saying goodbye was sad for me, but I was incredibly excited to get to Cuenca (and hopefully feeling better). At this point, I was feeling somewhat better, but very tired and weary. After class, I treated myself to a taxi ride and lunch at the Magic Bean again; I just can’t stay away! I’d called my taxi-driving friend, Bolivar, and arranged for him to pick me up 3 hours before my plane was set to leave. After struggling to drag all of my stuff (my backpack, giant backpack, laptop bag, and suitcase) down 4 flights of stairs, I had to say goodbye to my sweet host family and turn in my keys. After a nice drive with Bolivar, I, again, had no problems at the airport. Everyone tells me how bad flying is, but I have not had that experience. I did have to pay for my 2nd checked bag, but that’s the price I pay to bring everyone’s Christmas presents home! The flight to Cuenca was uneventful, and a whopping *sarcasm* 35 minutes long. When I retrieved my bags and walked out, I immediately recognized Kip and Karen, my cousins who I was going to be staying with. They were incredibly incredible, and I could have stayed with them forever, but I don’t want to get ahead of myself… Immediately, I learned that Karen is a fantastic cook and we ate well every day, which is perfect because I love to eat. They have a lovely apartment in a great location, and they gave me a whole bedroom to myself. I couldn’t have asked for a warmer welcome or a better last week. At breakfast, I was in hog heaven (excuse my Midwestern slang). We ate bread with egg and onion baked in, red bananas (way better than imported yellow bananas) with cinnamon, peanut butter and mango jam, and I had milk for the first time in months. Background info: Karen is my grandmother’s cousin. So we’re technically 3rd cousins, but I may also refer to them as my Aunt and Uncle, as it helped to avoid questions when we used these terms as opposed to cousins. and mountains. Yet, Cuenca also lacked the things that I grew to resent about Quito: the traffic and resulting smoke/pollution, the threatening people, the rushing. I don’t know exactly where we walked, as I had much less time to become familiar with Cuenca than I did in Quito, but they showed me the beautiful square, the river, several churches, and the places that they go on a regular basis. It is such a beautiful city, and I so appreciated my family taking the time to walk me around and show me their new home. Later on, we went out for dinner at their favorite pizza restaurant, La Furnace. The pizza in Ecuador is different than “American” pizza; I believe the sauce tends to be different. It is very good, and my mushroom pizza was delicious this night, and cold for snacks in the following days as well. The blackberry and coconut ice cream was a great dessert, as well. After another delicious breakfast, we met Kip and Karen’s favorite tour guide, who was absolutely lovely the entire day. They had arranged a tour of the nearby area, beginning with the *ruins at Ingapirca. The ruins were first Incan, and then Canari (with an accent on the ‘n’), and the influences of both can be seen at the ruins, despite how little is left of the original structures. The guide was very knowledgeable and friendly, which made the cold, light rain we had worthwhile. 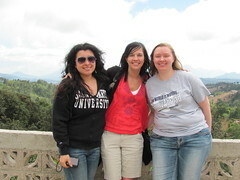 I also ran into two other students from the school in Quito on this day, and on another occasion, as well! What a small world. I would highly recommend going from Cuenca to visit these ruins, as the drive is absolutely beautiful. Also, stop at the church built into the side of the mountain, it’s breathtaking. After our tour of Ingapirca, we stopped for lunch at a typical Ecuadorian restaurant that mostly served pork. The food was amazing, as is the roasted/fried pork almost anywhere in Ecuador. We then went on to Chordeleg, a town with many jewelry shops that specialize in handmade silver jewelry. I enjoy wearing rings, and bought a beautiful silver ring for $7, thanks to Karen’s bargaining skills. I didn’t write much for this day… It was my first day of class in Cuenca. Apparently I should have known this, but I was pleasantly suprised to see the administrator/secretary from Quito in the office in Cuenca! It shocked me how much I appreciated seeing her, someone I knew, here on my first day at a new school (again). My teacher for the week was incredibly kind and friendly. I didn’t particularly enjoy my classes during this week, as the other students were not nearly as friendly and I was feeling burnt out on Spanish. The three of us went to two different markets in town. One of the two large markets has an outdoor market where local people sell goods other than food, and I could buy one of everything sold there. It was all handmade, much of it made with natural materials. One of the most interesting things that I saw while away was the “healers” here. They treat spiritual illnesses, I’m unsure if these illnesses are considered possession, or something else… You go to them and pay, then tell them what is wrong physically or mentally, emotionally, anything. It is always attributed to a spiritual problem, and they begin by rubbing a whole egg on your body. They then crack the egg into a plastic bag and read the yolk, determining the problem. They then beat you with whatever herbs and plants they determine are needed to treat you, and finish by spitting water (holy water, vinegar?) on your body. It was fascinating to watch. Parents bring their children, oftentimes preventatively, but even adults come for these services. The second market was a large indoor market where I bought some sweet chocolate and they bought their fruit. Kip and Karen have smartly started buying their goods from the same stalls at the markets. The people there recognize them, know that they live permanently in Cuenca and speak Spanish, and therefore give them appropriate prices and good quality products. We also enjoyed another pork lunch. The whole pig is roasted and then brought to the market, usually served with mote (a type of corn). Afterwards, I went to my second day of class. In the morning, I walked down to the supermarket with Karen. It’s a pretty walk across town and then down by the river and the foods in the supermarket are still beautiful and fresh. After we crossed the river, we walked through Parque de la Madre, Mother’s Park, which is filled with amazing sculptures. Instead of cutting down the dead trees, local artists were allowed to come in and carve them into animals and representations of mothers, even benches. Another cool thing about the parks in Ecuador: they have exercise/workout equipment, as well as playground equipment for the children. Again, I went to class, which I had alone and in the afternoons. I took four hours of class each day this week, instead of three, so that I could enjoy Friday, my last day, while still meeting my hour requirement. Karen and I took a walk to do a bit of shopping at her favorite booths at a different market, but the owners were not there. I had my very last class in Ecuador this day. My professor and I watched a movie (in Spanish), stopping periodically for me to explain what had happened. It was a bittersweet day, but I mostly felt relieved to have not only survived my classes, but passed and succeeded! My last day in Cuenca, second to last day in Ecuador. Karen and I returned to the artisanal market, where I got to meet Javier. Javier is a friend who works with tagua to make stunning jewelry and figurines. Tagua is known as “vegetable ivory”, as it comes from a plant and is more sustainable but is similar to ivory. He was so incredibly friendly and kind to me, he unknowingly made me sad to leave. I bought a beautiful yellow necklace and earring set from him and we took pictures together for me to share and promote his business, which I will do shamelessly, as he does great work. Check him out at El Mundo Ecologico de la Tagua on facebook. We all went for a walk to the square this day. Karen brought her bird food; it’s peacefully entertaining to watch all of the pigeons. We had another typical lunch out in the city. I appreciated that the restaurant served trout, as chicken or a vegetarian meal was losing its appeal. We stopped at the pizza restaurant again for an ice cream, and then Kip and Karen kindly encouraged me to take a nap before my flight. I so appreciated their concern and patience, as it took several days after my arrival for me to feel better after being ill. I took a nap every day while I stayed with them, and they always asked how I was feeling, which was comforting. Their landlady is from an influential family in Cuenca, and she knows everybody. I immediately knew why everyone liked her; she’s friendly and inviting and soft-spoken. She bought us humitas, made delicious cookies, and horchata tea to celebrate my arrival and departure, and she gifted me a beautiful hummingbird painting to remember my visit to Cuenca. As if to tie it all together, we ended up having the tour guide who took us too Ingapirca drive us to the airport. Kip and Karen waited with me at the airport to make sure that I got through security and everything okay, and as expected, I cried shamelessly as I walked away from them. I felt as if I could live in Cuenca, especially with them, forever, but it was time to go home. The plane ride was just fine, and I had arranged to stay the night in a hotel near the airport. My transfer to the hotel was waiting when I landed, and he even helped me get my things to the door of my hotel room. The room was much smaller than a hotel room in the USA, but it was clean (I always check for bedbugs) and affordable. The water didn’t run in the sink, but otherwise, I wouldn’t complain. After breakfast at the hotel, I spoke with my family on the phone and watched movies on my laptop to pass the time. The same driver picked me up and took me back to the airport, where I had no problems getting on my plane, besides having to actually wait to check my bags. I treated myself to lunch at the airport, where I met several very kind travelers. The trip from Quito to Panama went smoothly, thanks to a motion sickness medicine-induced nap, and I waited at the gate to get on my next flight. I did have a two hour layover this time, as opposed to one hour. After some time of waiting, airport employees had us all get up and form lines to go through temporarily set-up security again, despite the fact that we’d all gone through security previously to enter the airport. I still do not know why we had to do this: maybe there was a threat; other passengers said that inconveniences like this were common with this airline, who knows… I tagged along to the end of a missions group as to get through security easier and avoid being hassled by anyone who thought I was traveling alone, and they were wonderful. They let me follow them and wait with them to get through security, and they let me wait with them afterwards until we could board the flight. Once on the plane, I was nervous because I could see lightning almost all around the airport. I was afraid that the flight would get delayed or cancelled due to weather, and I just wanted to get home to my family… We eventually got on the plane 30 minutes late, and we then had to wait for a break in other planes landing and taking off, as we had missed our scheduled time. 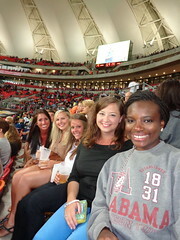 I sat by two students from Augustana who were very sweet, and we all felt the same way: we were excited to go home. I slept off and on throughout the entire flight to Chicago, and I could see Chicago when I finally woke up for good. My heavy bags seemed much lighter when I walked out of the baggage claim (which took too long) and saw my family.